★A set of 12 colors painted maker pens: Red, Yellow, Blue, Purple, Gold, Silver, Orange, Rose, Pink, Brown, Dark green, Green. ★Safe to Use: They are water-based pigment ink, waterproof, odorless and quick drying, non-toxic and you won\'t feel uncomfortable about its smell. Safe and environmental-friendly. 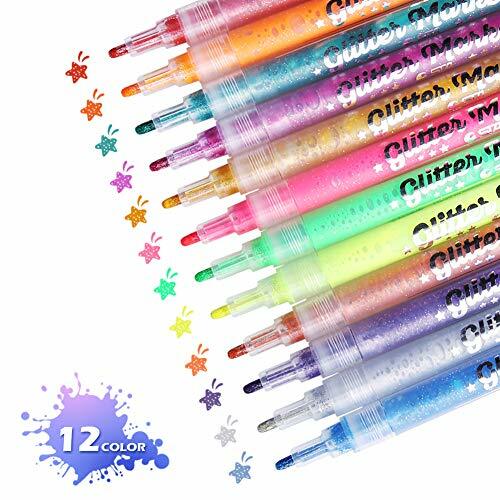 ★Premium Quality Highlighter Pens: Compare with most other similar painted pens, our ARINO paint maker pens added pearl powder to the ink, which enables the pens highlighter. ★Wide Applications: The paint pens work great on almost any surface, create your stunning masterpieces on drawing, coloring ceramics, wood, stones, fabric, glass, paper, decorate your clothes, Easter eggs, shoes and other DIY crafts. Ideal for Christmas Gift also. ★Easy to Use: Before use, put the penpoint up and shake the ink evenly; Later press the penpoint up and down to pump the ink and then you can draw; At last please cover the cap right after use in case of the ink drying.